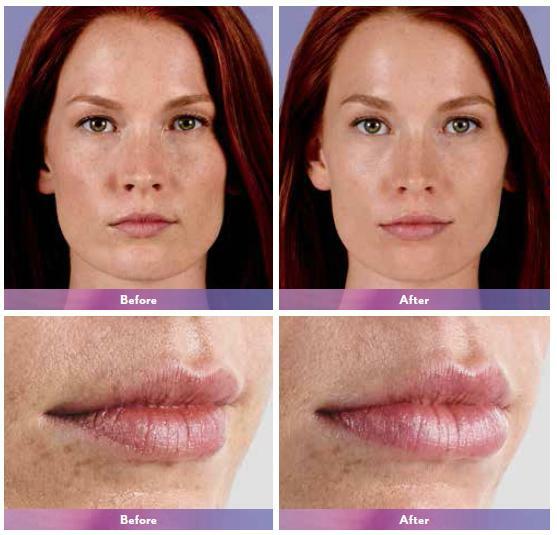 Juvederm XC, Juvederm Ultra XC, and Juvederm Voluma are the ‘next generation’ dermal facial fillers used to treat fine lines and wrinkles, eliminate lip lines, plump up lips, address acne scars, and improve nasolabial folds. It’s a hyaluronic acid (HA) gel that’s directly injected into the target areas of your face that will result in a more youthful appearance. According to experienced facial plastic surgeons like Dr. William Silver, the treatment itself lasts a relatively long time, primarily because it’s the only filler that’s available today with such a high concentration of hyaluronic acid in addition to its unique formulation process. The procedure uses a very smooth gel that easily flows into your skin, therefore creating a naturally, smooth look. It also hydrates the skin while adding volume. The dermal facial filler gel primarily consists of hyaluronic acid, which is naturally found throughout the body and encourages the skin to retain moisture and stay hydrated in addition to restoring volume to both the surface and underlying foundations of the skin as well. It is not, however, derived from any kind of animal tissue. Also, there are no testing requirements prior to receiving the treatment. The facial filler gel is produced in a very special way that results in maximum concentration levels of hyaluronic acid as compared to several other hyaluronic acid-based products used for youth-enhancing treatments today. This extraordinary cutting-edge technology is produced in a gel-like form that is superbly uniform in terms of consistency that gives patients youthful looking and naturally smooth skin once the product is injected. The innovative gel is different from all other products containing hyaluronic acid due to the fact that the gel is super smooth instead of more granular in nature. Juvederm is one of the first dermal facial filler treatments that’s been shown to be super effective and very safe for individuals of color. In the past, some hyaluronic acid dermal facial fillers have been known to cause problems when used on individuals with darker skin tones. However, this is no longer an issue thanks to the special manufacturing process and unique chemical composition that this amazing gel is made from. Injectable dermal facial filler gel treatments are usually done very quickly, in as little as 10 – 20 minutes in most cases. The procedure is considered a nonsurgical treatment that’s performed by injecting the special hyaluronic acid gel straight into the targeted layers of the skin. The results are not only instantaneous, they’re simply amazing as well. Again, there’s no required skin test prior to treatment. Although the recovery time is based on the level of severity regarding the specific treatment, most people go back to work the very same day. In fact, the process is so fast that many people schedule their treatment either at lunchtime or on their way home from work. How’s that for convenience? Dr. William Silver has newly relocated and serves both new and current patients from all over the Atlanta area including Dunwoody, Buckhead, Sandy Springs, East Cobb, Roswell, Alpharetta, Marietta and beyond. Call his office today for an initial consultation.